Here's another one of those marvelous vintage street scenes from Manhattan. Pictured, circa mid sixties, is the intersection of 3rd. Avenue and 42nd. Street showing an early non-air conditioned 5300 GM New Look flagged for the Manhattan and Bronx Surface Transit Operating Authority (MABSTOA) crossing what I believe is 42nd. Street (if I remember correctly, 3rd. Avenue had the peculiar fluorescent street lights at that time). So, if I am correct, the unidentifiable Mack in the same image is sitting at a bus stop on 3rd. (I say unidentifiable because I am uncertain as to whether it might be ex Surface or ex B.O.T.). However, I'll leave it up to my learned New York colleagues to better interpret the scene. Photo courtesy of New York City archives. I'm guessing the 5303 is in the 3300-3500 series. The bottom skirt has yet to be painted across. If I am correct, the later MABSTOA buses had the bottom painted across and most of the 33-3500's were painted later. The photo is fuzzy and I am trying to zoom in the best I can. If the fleet number on the Mack was visable, that would tell where the bus originally operated. I also notice that the Mack has a full front ad rather than the earlier smaller ad racks. Thanks for the help - I'm inclined to agree that the New Look is a 5303 - the bullet shaped Michigan Markers have already replaced the Art Deco's of the first 5300's. Additionally, the first large order of New Looks (almost 500) for MABSTOA were 5303's. There is another however; what happened to the Fifth Avenue 5302's? 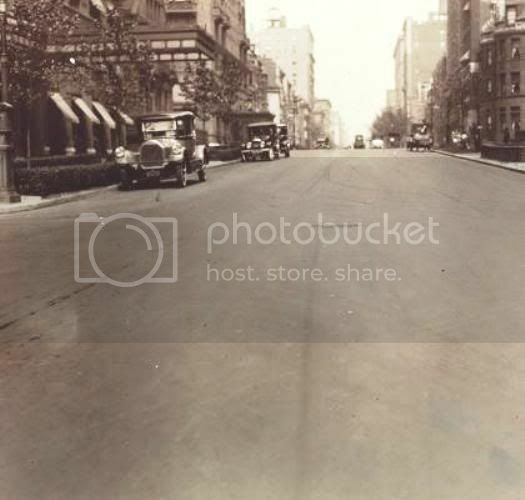 In continuing my new 'Vintage New York City' series, I present another interesting photo taken sometime in the early thirties on Fifth Avenue in downtown Manhattan. 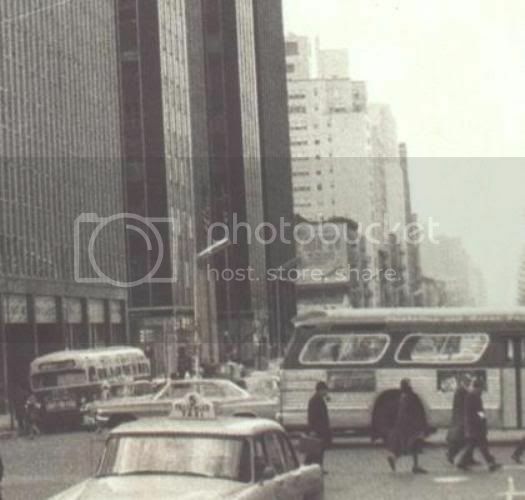 The bus, with its convertible top in place for winter operation, was hand made in the Fifth Avenue Coach uptown shops. Designated as their 'Type A' and adapted from the 'B' Type London General, these two man double deckers were powered by Waukesha engines and were produced between 1917 and 1921 with many seeing service through the late thirties. Fleet number 303 built in 1917 has been preserved by the New York City Transit Museum. Photo courtesy of the New York City Archives. 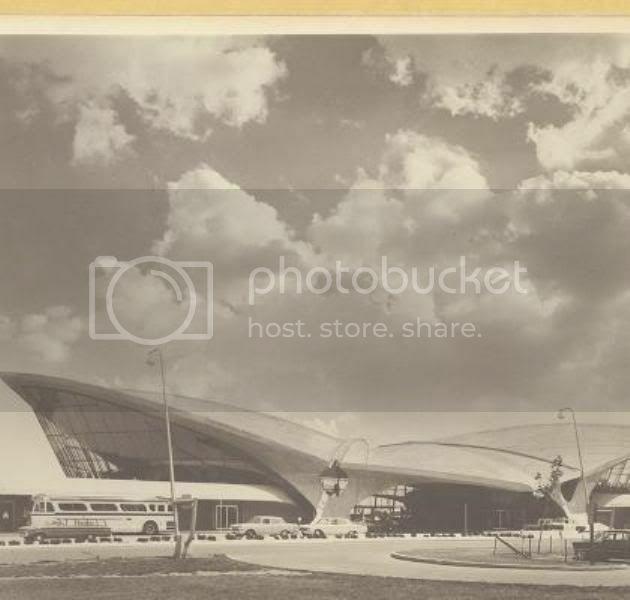 Stepping out of the twenties for a moment, and much closer to present day (circa 1960), we see a nice shot of the then new Trans World Airlines terminal at the then New York International Airport (now JFK). Of course, the focus of the image (to me) is the GM PD 4104 standing to the left of the frame and operating for Carey Transportation - the then premier flight connection company in New York. How foolish of the photographer to take a picture of the silly building when it was the bus that should have been showcased! I guess you can't have everything! 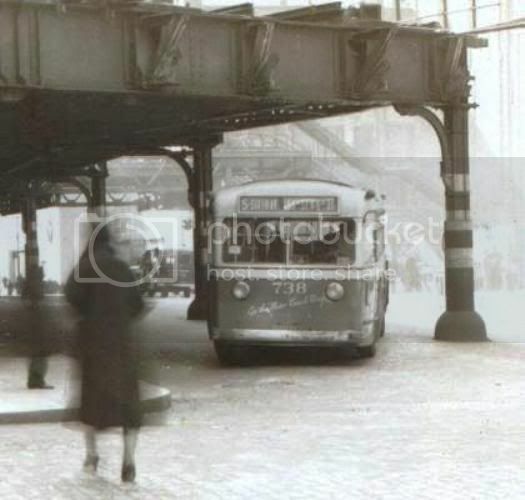 The year is 1941, and we find ourselves at Columbus Avenue and 98th. Street on the upper west side of Manhattan where we see two 1939 Yellow Coach Model 740's operating for the New York City Omnibus division of the Omnibus Corporation. The Yellow model 740, of which 100 were built for NYCO, was the first to utilize a Detroit 6-71 Diesel engine combined with a Hydraulic (automatic) transmission. Most, if not all, of the buildings seen in the background date from as early as 1880 and have probably long since been destroyed. Note the standard Bus Stop sign of the era to the far right of the frame. Nice buildings and buses, Mr. Linsky! Just makes you want to go back in time, doesn't it? You really know how to pick historical photos, Mr. L! I recall that 9th Avenue (in and around the Lincoln Tunnel entrance plaza) also had those unusual streetlamps. 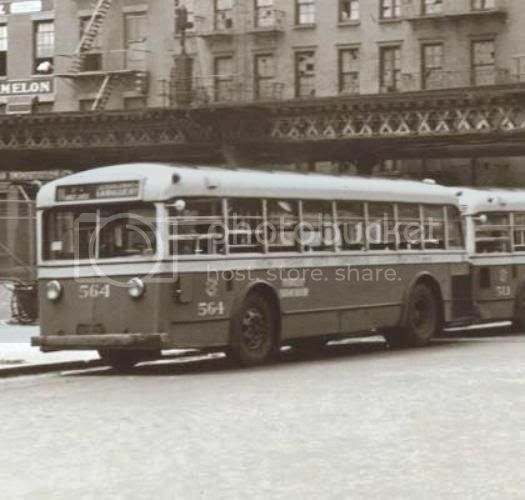 Taken at Church and Murray Streets in downtown Manhattan circa 1941, the below image shows fleet number 738 - a 1937 Yellow Coach Model 728 and one of 268 (501 to 768) operating for the New York City Omnibus Corporation. The versatile and popular 36 passenger 728 boasted an improved 479 cubic inch gasoline engine mounted transversely in the rear with a patented 'angle drive' accompanied by a mechanical transmission with almost 600 produced between 1935 and 1939 when it was replaced by the far more recognizable Model 740. Number 738 is seen on the newly acquired routes of the Triangle Bus Corporation. What is perplexing to me is the fact that 738 is signed as the Number 5 Fifth Avenue line which may have been an extension from 57th. Street to the Battery. 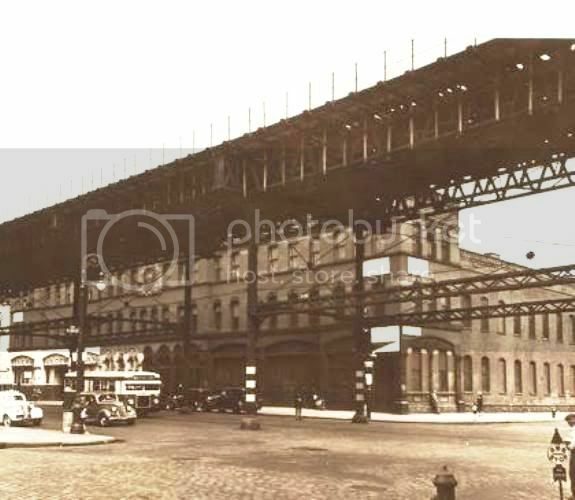 Notice the elevated structure which was a remnant of one of the first steam engine powered lines in Manhattan. Here's another better view of a New York City Omnibus Yellow Coach Model 728, fleet number 564 seen in 1938 at Greenwich and Gansevoort Srteets in lower Manhattan. 564 is apparently on layover along with another NYCO 500 series behind it. Notice the roof duct just above the drivers window which served as an early version of a motorized ventilation system required by New York State law. Also of note is the round decal under the drivers window containing a permit number issued by the City of New York Department of Plants and Structures - the regulatory authority at that time. Shown trundling Second Avenue and about to pass 96th. Street heading downtown is a 1933 Mack Model 'BT' operating for the East Side and Comprehensive Omnibus Corporations. The 'BT" model was revolutionary for Mack and introduced their first all steel body (with the exception of the roof which was made of steam bent plywood), four-wheel air brakes and tubular cross members in the chassis frame. Eastside & Comprehensive was one of only two New York operators to buy BT's with five on their roster and another fifty to Brooklyn Bus Corporation - Brooklyn eventually sold most of theirs to E & C.
An interesting note; the Second Avenue elevated line also seen in the image which, incidentally, ran a spur to Long Island City over what is now the upper roadway of the Queensborough Bridge, was torn down just before World War II with the scrap steel being sold to Japan! Here we see a squinter's eye view of a duet of vintage buses at the corner of 94th. Street and Second Avenue in Manhattan. Traveling southbound approaching 94th. on 2nd. is another Mack Model 'BT' operating for the East Side and Comprehensive Omnibus Corporations, and sitting at layover at the corner of 94th. Street is a Yellow Coach Model 728 flagged for New york City Omnibus Corporation. 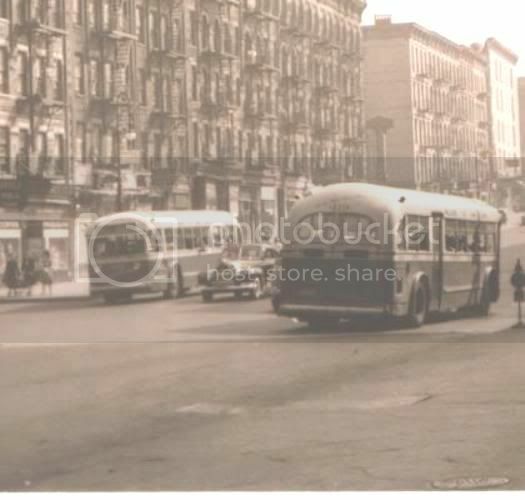 The picture had to have been taken post 1936 because it was in that year that the Omnibus Corporation took over the cross town routes of Green Bus Lines and 96th. Street was one of them (there was no bus operation on 94th. Street). Of note on the Mack is the very minimum amount of driver visibility through the windshield due to an over sized sun visor. Another great picture. Amazing to see curbs with no cars parked there and no other cars in the picture. Wonder if it was a Sunday? No! there just weren't that many cars in those days. Picture this; back then you could park freely at any time anywhere in Manhattan as long as you didn't block fire hydrants, bus stops or driveways. Take a look at the image below of West End Avenue and 74th. Street circa 1935 and you'll get an idea of how easy parking was - today, you couldn't get a shoe horn between the bumpers! 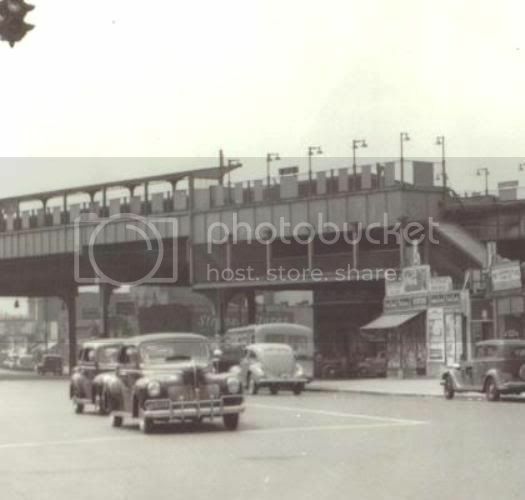 As Archie Bunker would say; "dem was da days"
The interesting photo below was taken looking west to the Liberty Avenue elevated line on Rockaway Boulevard in Ozone Park, Queens circa 1939. 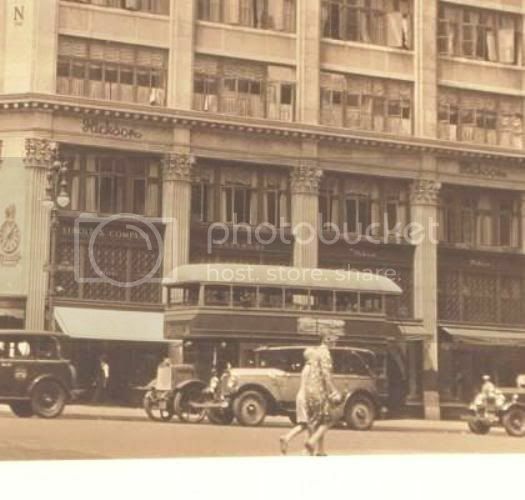 The bus, parked at the elevated stop, was a Green Bus Lines 1935 Mack Model 'CX' with an unseen fleet assignment although the CX's were numbered G501 to G535. 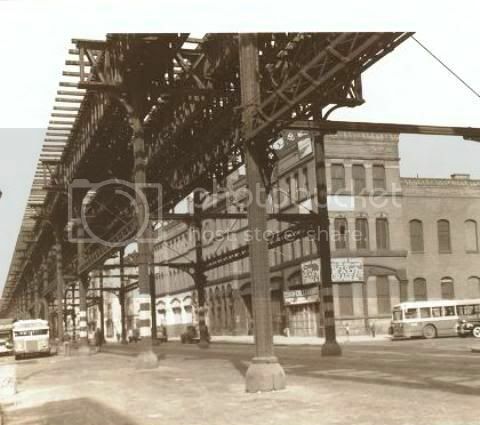 The company took over the route, which ran from Baisley Park to the Brooklyn border, in 1932 and replaced what was once a single track trolley line operated by Jamaica Central Railway (the predecessor to Jamaica Buses). Notice the old traffic signal light hanging from a post to the top left of the frame - the modern amber warning that we now get before a red light was accomplished by illuminating both the red and green lenses at the same time momentarily.